Presented by Theatre Erebus Inc.
and workshopped by Theatre Aquarius founding Artistic Director Peter Mandia. It was first produced in May 1988 by Theatre Focus at their third floor theatre space at 18 John Street North in Hamilton. The cast for the reading includes Jo Skilton, Rose Pye and Ilene Elkaim. REQUIEM will be directed by Liz Inman, a long time friend and colleague of Jean Coley-Hughes. There will be a talkback discussion after the reading and audience participation is welcomed. 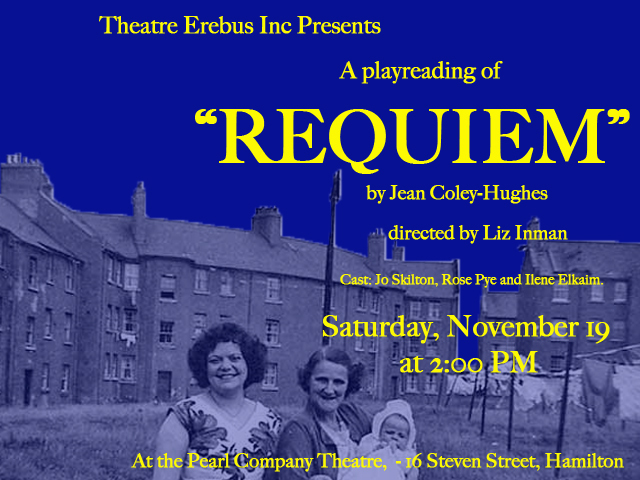 Hughes passed away in August of 2016 and this reading is meant as the first step in seeing the play REQUIEM receive a full production some time in the next eighteen months. Theatre Erebus is seeking plays from local Hamilton Playwrights to be part of this ongoing series of play readings at the Pearl Company. Anyone interested in submitting a play should visit http://www.theatre-erebus.ca for submission guidelines.